Our team has had a chance to discuss your qualifications, and unfortunately, we have decided to pursue other candidates. We will keep your resume on file for six months and if another position arises...blah, blah, blah, blah, blah, blah, blah, blah. 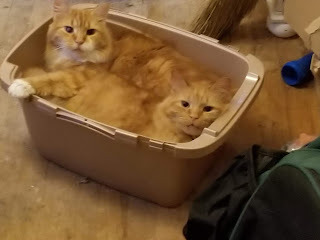 To prove I'm fine, here's cats in a basket. LIES!!!! They will keep my resume on file until the janitorial staff comes around and empties the trash cans. If it is kept, it's kept in an old, rusty file cabinet, in a folder marked with the month and the year. At the end of each month, a temp worker who is paid a couple dollars above minimum wage is instructed to pull the files from six months earlier and recycle them. At least my resume will be going to make one of those coffee cup trays so that it might see the inside of a conference room within the company. It's possible that my resume and application sit on a server within the company somewhere. Maybe when they're desperate to drum up business, they'll pull the addresses from those applications and add them to their mailing lists. Then, when I get email, or regular mail, from the company I can momentarily have my faith in humanity restored before it's crushed under the wait of a catalog. No, I don't want to buy your products because I'm still not working and can't afford anything, cold-hearted bastards. Anyway, here I sit, not bitter at all. Not seething with fury and waiting for the first telemarketer to call so I can unleash my wrath. No, I'm calm and cool and collected. I eagerly await the next prospective employer to email me to tell me that my skills are impressive, and I exactly what they are looking for, but for reasons, they have to choose someone else. No, I'm fine, really. Job hunting is a very demoralizing event. Thanks for the kitties.